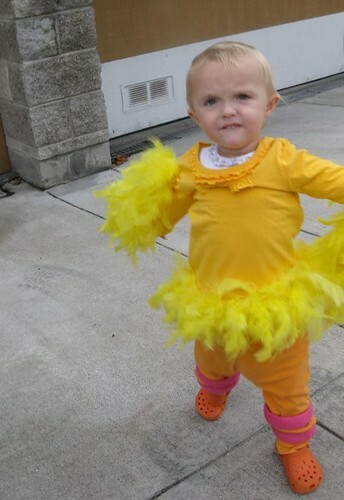 Logistically, she was not going to tolerate a stuffed body armor of feathers. 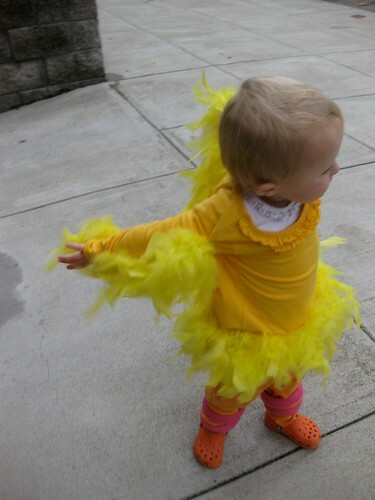 Bonus: Orange crocs to match the ensemble. Cut a strip of boa long enough to go around the bottom of the shirt. Note: a boa is a strange beast. It is made of feathers loosely stuck into a braided cotton twine. The best way I found to cut it is to get your fingers in there, and push the feathers gently aside. When you have a place that will work to cut it, wrap tape around that place. Duct tape or scotch tape will work, but just something to keep the feathers from flying EVERYWHERE. Then cut, and if you need to wrap more tape around the ends that are now more exposed, do that. Using a needle and thread, gently whip stitch the boa to the bottom hem of the shirt. I took big huge stitches, but then carefully pulled the thread in around the “spine” of the boa itself. You are kind of hiding the thread in close to the shirt, rather than letting the stitches “bundle” the feathers together. If this were the christmas tree on the top of your car, you want to be tying the trunk of the tree down, not just gathering the branches. You can leave a little gap in the back, because the feathers will cover over the gap. And if the shirt is a little tight to get on, then DO leave a gap in the back, because the boa will not stretch.Make sure not to pull the thread too tight, or the stitches will pop when the darling bird is pulling the shirt on and off. Fold the pink fleece over, and sew some tubes. Because I used fleece, I let seam allowances stuff the tubes themselves. I cut strips of fabric about 4 inches wide. I folded the fabric in half (making it 2 inches wide) and then I sewed tubes about 1 inch wide with about a 1 inch seam allowance. Then I turned the tubes inside out, so that the seams were on the inside of the tubes, and all that extra fleece plumps up the tubes. 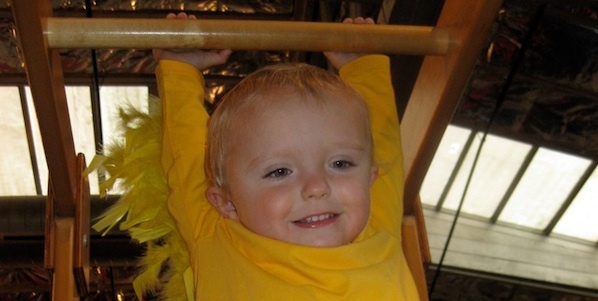 Measure your child’s pants, and decide how long each tube needs to be. 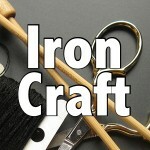 Essentially, you will make “life savers” and slide them up the legs of the pants and sew them into place. I cut the lengths of tube, and left just a little extra, then I tucked one end of the tube into the other side, and closed the donut that way. I just tacked these loosely down. They need to be sturdy enough to stay on, but not so tight that the stitches pop, and the legs don’t move. 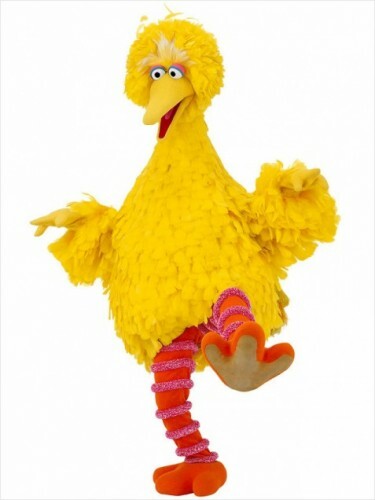 Big Bird himself has six rings on his legs. “little bird” only had two rings, down by her ankles. And that was enough for us. I had grand designs for a sweet yellow hat. Or even just a headband, with an excellent feather arrangement at the top. Little Bird had thoughts of her own about any head gear of any sort. “not gonna happen”. 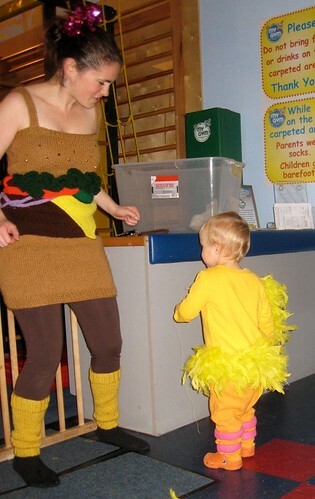 Here she is, dancing with one of our favorite people, dressed in a hand knit Cheese Burger costume, complete with french fry leggings. We had a BALL. 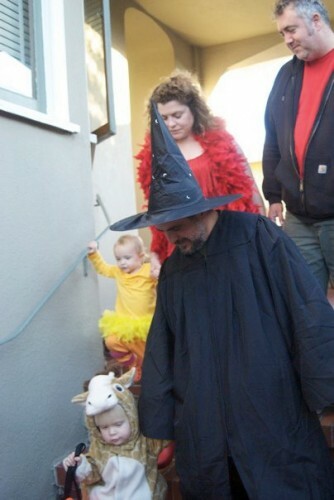 Little Bird, Trick or Treating with Little Giraffe, a Wizard, a flapper and a Daddy. 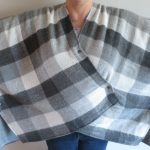 8 years ago by Susi in Halloween , Holiday , Needlecraft , Projects , Sewing , Sewing Projects | You can follow any responses to this entry through the RSS feed. You can leave a response, or trackback from your own site. Thank you!. WE love our little bird. Love this costume. The colors are perfect and the Crocs are too cute!